Of course, the courage of Bonhoeffer to defy the compromising state church of Germany in the early days of Nazism is inspiring. A church that did not stand with the Jews, he said, was not the church of Jesus Christ. So at great risk he came out. Wolfhart Pannenberg, 84, is the retired professor of Systematic Theology at the University of Munich where he served since 1968. He was very much the rage when I was in seminary, and I was honored to sit in some of his lectures while I was a student in Munich. The connection I am drawing between Bonhoeffer and Pannenberg is their strong statements about what constitutes the un-churching of a church. For Bonhoeffer it was the failure to stand with the Jews. The “Aryan Paragraph” was a Nazi demand that all Jewish officers and eventually members be excluded from the German church. For Bonhoeffer, that un-churched the church. For Pannenberg the line is crossed when a church approves of homosexual relations. While Bonhoeffer drew the line at the church-rejection of Jewish ethnicity, and Pannenberg drew the line at the church-affirmation of homosexual behavior, the principle was the same: both the rejection of Jewish ethnicity in the church and the affirmation of homosexual behavior in the church stand in opposition to the cross of Christ. Christ died to include Jew and Gentile in one body. “He has made us both one . . . that he might . . . reconcile us both to God in one body through the cross” (Ephesians 2:14–16). Therefore to exclude Jews is to oppose Christ and his cross. And Christ died to bring repentant sinners into the kingdom of God. But homosexual behavior excludes people from the kingdom. “Do not be deceived: neither the sexually immoral, nor idolaters, nor adulterers, nor men who practice homosexuality, nor thieves, nor the greedy, nor drunkards, nor revilers, nor swindlers will inherit the kingdom of God” (1 Corinthians 6:9–10). To affirm a way of life that excludes people from the kingdom of God, is to stand opposed to the cross of Christ which aims to save people for the kingdom of God. For the post by John Piper…. …from March to July 1935 three new laws appeared, designed to look like the state’s care for the Church’s welfare but actually intended to shackle it. The first was signed by Herman Goring as prime minister of Prussia and provided “finance departments” for the Prussian provincial churches, which were to “guarantee” local church assets and contributions, in reality, however, this meant the local Confessing pastors in the Old Prussian Union could no longer take up their usual collections without risking prison. The two other laws were signed by Hitler himself, because they applied to the entire nation. One created a “Legislative Authority for (the administration of) Legal Matters in the German Evangelical Church”. Thus it denied the Confessing Church access to the regular public courts. It was one of Hitler’s countless violations of German law. The other of Hitler’s decrees, one which was to prove particularly drastic, created a Ministry for Church Affairs headed by Hanns Kerl, who was one of Hitler’s old comrades-in-arms and had his confidence…It was said of him that he was the only Nazi leader who knew the sayings of the Bible, but he was noted particularly for having described the Party’s policies toward the Church as blunders on several occasions. Along with regional Party leader Wilhelm Kube, he was one of the highly prized Nazi functionaries who wanted to see the nineteenth-century dream of a “national church for all Germans” realized. (The) 17 Degrees on Implementation, which were published gradually one after the other, had the effect of tying the hands of the Confessing Church almost completely. They also made cooperation between the “destroyed” and “intact” provincial churches increasingly difficult. (Ferdinand Schlingensiepen, Dietrich Bonhoeffer 1906-1945: Martyr, Thinker, Man of Resistance, 183-184). The Life of Pastor Youcef Nadarkhani Hangs In The Balance…Let Us Continue to Pray! Dietrich Bonhoeffer (1906-1945) was one of the most compelling theologians of the twentieth century. Moreover, his life and writings continue to fascinate and challenge Christians worldwide. The Wheaton Theology Conference will explore Bonhoeffer’s thought and ministry, focusing particularly on his views of Jesus Christ, the Christian community, and the church’s engagement with culture. In the twenty-first century, Bonhoeffer’s legacy is as provocative and powerful as ever. Bonhoeffer: The Cross is Laid on Every Christian! The cross is laid on every Christian. The first Christ-suffering which every Christian man must experience is the call to abandon the attachments of this world. It is that dying of the old man which is the result of his encounter with Christ. There was no lack of criticism and suspicion of the work going on at Finkenwalde. Bonhoeffer’s ideas were not everyone’s cup of tea. Many of his colleagues considered them “monkish”, and there were some strange rumours in circulation about the ministry. Not least among those whom expressed astonishment was Karl Barth. But more and more candidates for ordination were asking to be assigned to Bonhoeffer’s seminary. (Ferdinand Schlingensiepen, Dietrich Bonhoeffer 1906-1945: Martyr, Thinker, Man of Resistance, 182-183). (Ferdinand Schlingensiepen, Dietrich Bonhoeffer 1906-1945: Martyr, Thinker, Man of Resistance, 182). Bonhoeffer saw very quickly that his intention for the preacher’s seminary to constitute a community living and learning together could not be carried out if all members of the community except the director and his assistant left Finkenwalde at the end of half a year and were replaced by a new group of ordinands. He therefore reminded the Confessing Church’s Council of Brethren that it consented, after he returned from England, to allow him to found a House of Brethren as a spiritual centre. 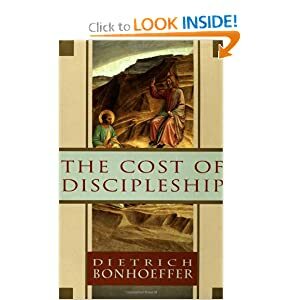 Of his first group of students, six wanted to stay and were allowed to do so, and with them Bonhoeffer was able to pursue the ideas inspired by his visits to the Anglican monasteries…The chief task for all members of the House of Brethren…was to maintain their “life together” with firm rules. Thus, as each new group of ordinands arrived, they found a monastic community life already established, and did not have to be persuaded to adapt themselves to it. Half an hour of concentration: it is amazing what comes into your head during that time. the mind moves around, memories arise, dreams awaken. Suddenly anger flares up. When we told Bonhoeffer of this, he said that was all right, things have to come into the open, but they must also be tamed and through prayer. (Ferdinand Schlingensiepen, Dietrich Bonhoeffer 1906-1945: Martyr, Thinker, Man of Resistance, 181).